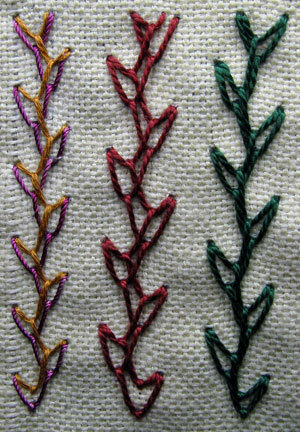 This variation of overlapped feather stitchs is one that came out of my TAST feather stitch experiments. I did the first line in 2 colours so that you can see how the second row of stitching shares the top holes of the first row but has a shallower V.
The shape of this stitch can be varied by changing the depth of the V and the angle on the needle when working the second row. 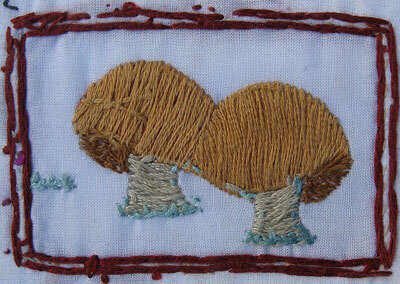 The first line is Threaded Arrowhead Stitch. The second line is also Threaded Arrowhead Stitch but using a smaller stitch which doesn’t look as different from the first line as I thought it would…this is the last line of Arrowhead.. 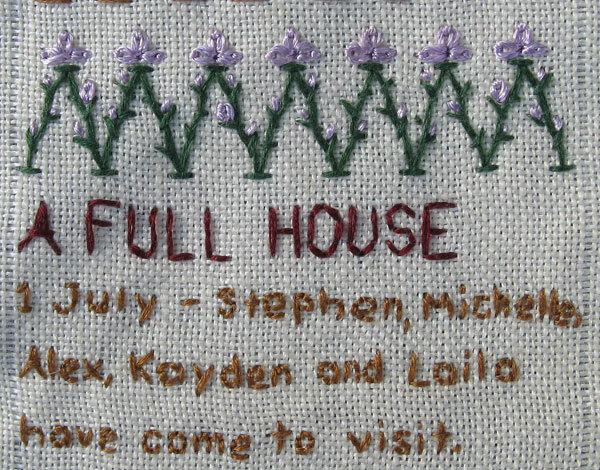 The Third Line is the Start of Back Stitch…and no I haven’t flipped the image by mistake, it just appealed to my sense of humour to stitch back stitch backwards. 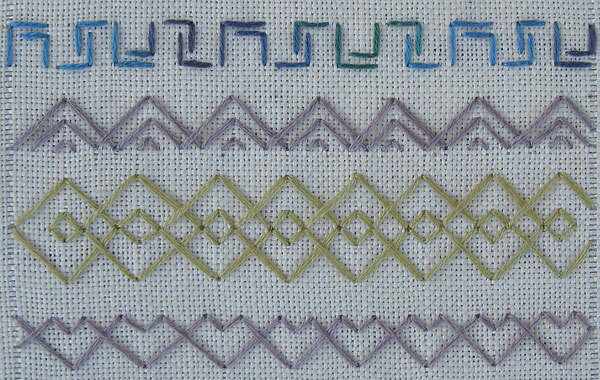 The 4th line is Whipped Back Stitch…the first have of the line shows the bigger back stitches that I did, the second half of the line shows how whipping the back stitch with the same colour makes a more solid line. 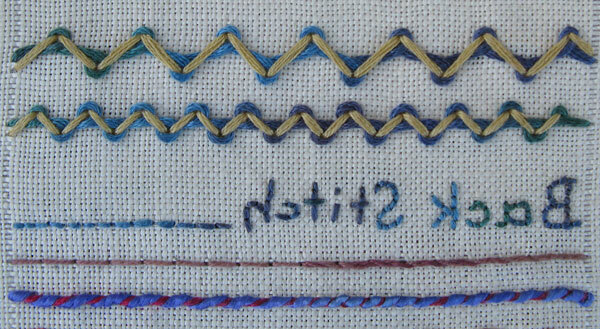 The 5th line is back stitch whipped with a contrasting thread, I have also done a couple of different lengths of backstitch along the line to show how the shorter stitches alter the look of the whipped backstitch. and the 5th row is also the start of my Take it Further August colours…Sharon has made the thread selection of threads for the August colours very easy for me, on the last wed of July she gave me some of the threads that she had recently bought, the next week I found out that she had used those threads for the August colours. I did a quick sketch of my idea for the first line and then it twisted my mind until I figured out that some of the arrowhead stitches (turned out to be every 4th stitch) have to be bigger than the others, it was worth working out because it makes a lovely seam. The second line is the arrowhead variation that I did last year for TAST. Line 3 is a 2 stitch Variation of the second line, when I realized that it was a row of upside down hearts I mirrored it with a second row so that I could do a single row, the bottom line, the other way up to show the hearts. 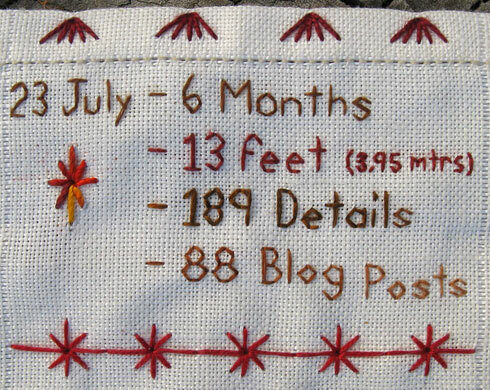 It is 6 Months since I started this sampler and to mark the 6 months I have started the 5th panel with a summary of the information that I record on the back of the sampler. 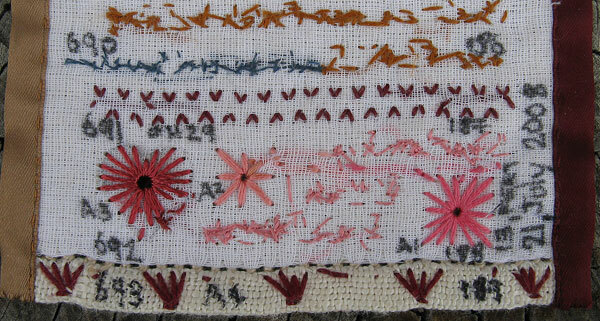 The seam at the bottom is a row of elongated Algerian eye stitches. I started backing the panels of my sampler with a light weight fabric because I like the firmer feel of the double layer of fabric…I then realized that I could also use the backing fabric to record statistical information…the number on the right hand side are the blog post detail numbers, numbers preceded by letters are the stitch count ie ch29 is the 29th chevron stitch variation, the number on the left side is the running count of details on the sampler, I also record the panel number and the date I start and finish each panel and along the edge I mark the length in feet and metres. by having the bars meeting along the edge. 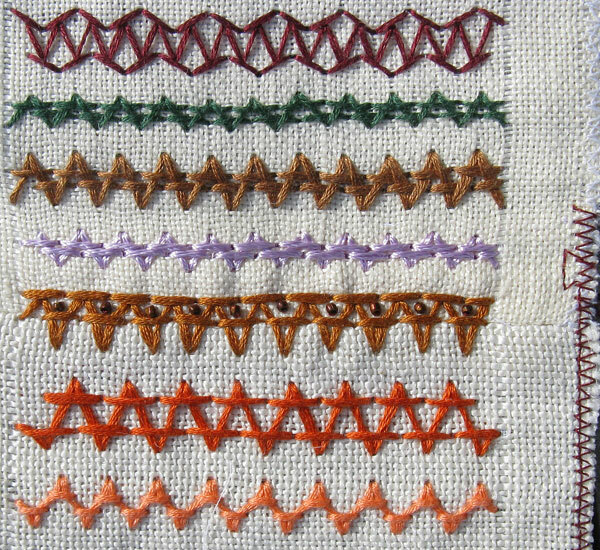 a Chevron Stitch variation of Elizabeths, I followed her illustrations for how to do the stitch, Then varied the angles, width and spacings of the stitch, it is amazing how different each one is with only small changes. I left the side border of my sampler so that you can see where I joined another peice of fabric on to make the panel longer. 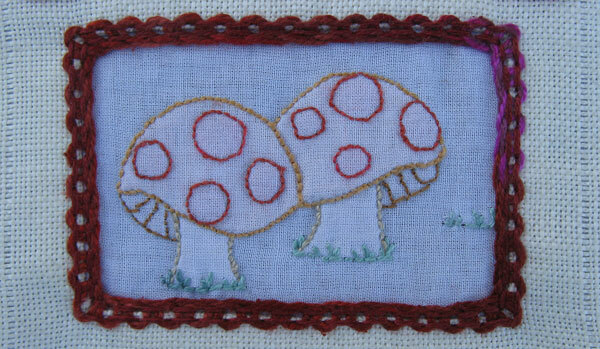 The top line tonight was inspired by one of Lin Moon’s TAST stitches. The Bottom detail records the visit of my brother and his family.